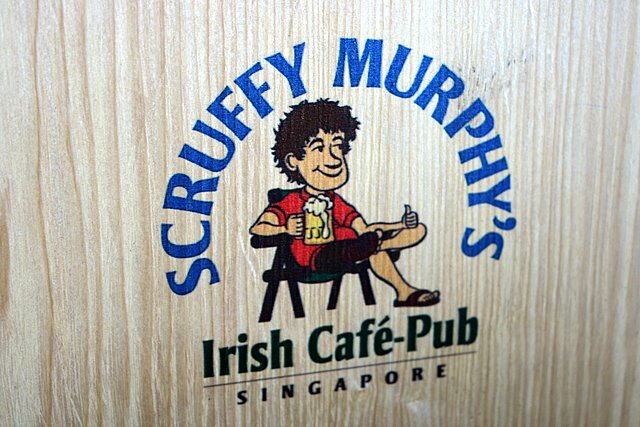 Scruffy Murphy's is Gaelic Inns' outpost by the East Coast Parkway. Sunday mornings see this Irish restaurant-pub packed with Caucasians and very tanned beach-goers. 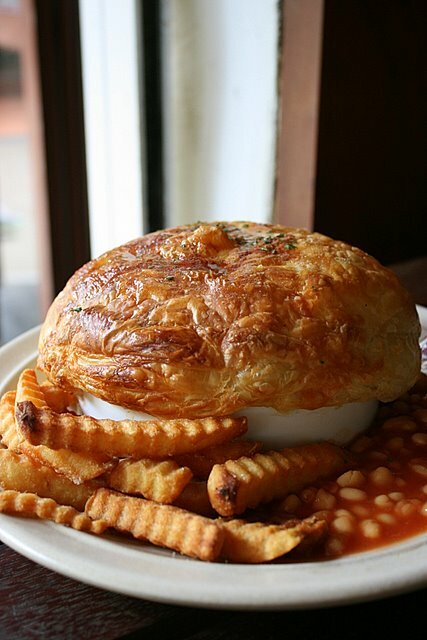 We tried their Steak and Guinness pie (around S$14.50). It required 20 minutes to prepare but arrived looking great - a behemoth of a golden puff pastry dome atop a large bowl. Crisp crinkly fries and baked beans complete the ensemble. The puff pastry was delicious! Unfortunately not much else was. Yes, there were chunks of tender steak inside, with carrots, onions and celery but the seasoning was really bland. Guinness? Barely detectable. One reader recommended me their breakfast. This is my second time trying the Scruffy Breakfast (S$10.20). While not as robust as the Jones English Breakfast at Dempsey, this one is a lot nearer home and is half the price. But either the cost-cutting has come into play, or their portions are not very consistent. This time the bacon and mushrooms were measly! Egg done with runny yolk, a boon for those who like it like that. 1000 East Coast Parkway, B7 Marine Cove, Singapore. Im glad you like Japanese food! I like looking at your pictures! Oh my gosh, am I hungry looking at this...makes me drool for it....must go for it. Is this the one near Orchard Hotel too besides this EC branch. How disappointing that the flavour was bland, because that pie certainly looks delicious! I LOVE the close-up of the inside - yum! but your pics take the cake lar! absolutely cosy. beautiful! the breakfast looks great! but is it filling enough? Yeah that's how I remembered Scruffy. Looks good, service not bad, good portions etc - but just bland. Never been to Singapore, but we visit the UK several times a year. 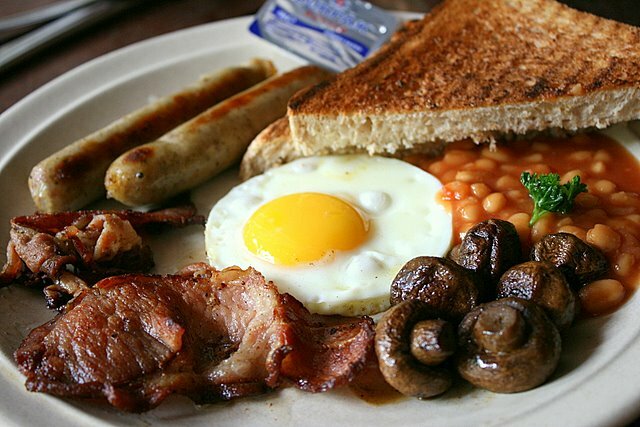 (3) those wonderful UK-style breakfasts (except for the blood pudding ... LOL). Enjoyed your post and the great photos. the puff pastry looks good! I'm sorry, but my associate Louise ("chiff0nade", also known as "therealchiffonade") has been drinking and taking her anti-depression pills again. When she does that, she impersonates people on the food blogs, such as "MrsDocChuck" on your blog. Louise has already caused our website CassandraCrossing to be closed down. And she is presently under investigation by federal authorities. I'm sorry that she has invaded your wonderful blog. 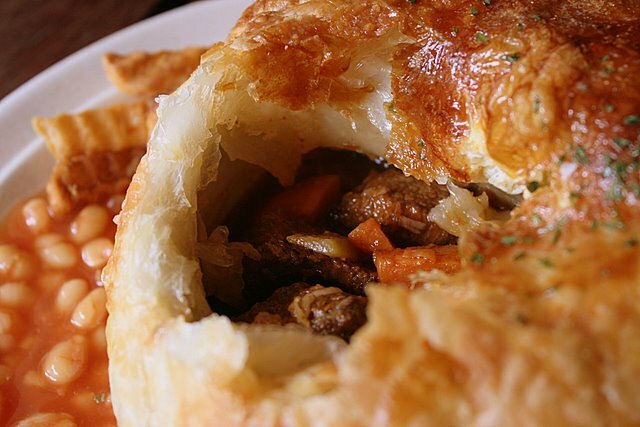 Yes, I did wonder if steak & Guinness pie is meant to taste like that - a bit on the bland side. But it was still more than edible. Good meat used. DocChuck: thanks for visiting! I wish I could visit Ireland and Scotland to try the real deal too. LIC: The breakfast was filling enough, provided you don't share! Nic: The sausages had strong herbs and spices in them, not the generic type. Jencooks: all the Irish pubs here seem to be related, under the Gaelic Inns umbrella. But menus may vary from outlet to outlet. Kumiko: you've got a pretty blog too! Too bad it didn't taste as good as it looks. I used to make that kind of pie for my son and had to make it bland on purpose, since he didn't like any kind of strong flavor.